I have been working very hard to complete two novels simultaneously in order to release them at different points in 2012. Sometimes I need a visual to inspire me to keep going, that my work will be worth it in the end. You see, I am one of those authors who, although sales are nice, doesn’t write for glory. I actually do write because I enjoy telling stories. John Lennon once described his writing process as thinking of things that relate in his mind and if other people relate to it, then that’s cool too. He didn’t write for other people. He wrote for himself. I’m the same way. I write stories that I would enjoy reading and if other people enjoy them too, then that’s an added bonus, and we can share in that experience of characters going on a journey. There are drawbacks to being an independent author, though, such as not having the profits that can be re-invested in editors, cover designers, and big marketing machines. Independent authors perform the jobs of half a dozen people by themselves. In my case, I learn to manage my writing career through trial and error. Being forced to stand on your own two feet and depend on your own self-discipline to complete this process of publishing a book is such a growth experience for the soul. When you are in control of every detail associated with your public name, you tend to work a little harder and put a little extra something special in the finished product. Buying one of my books means you are buying a product that I oversaw from beginning to end. I design my own covers, I find fellow writers willing to trade editing services, etc. You don’t need a huge publishing house to become an author. All you need is talent for storytelling, ambition, discipline, and a willingness to accept that you are going to make mistakes sometimes. Each book should be seen as a growth experience over the last book. If you think you’ve reached your peak and learned everything there is to learn about publishing, starting your next book will deflate your ego down to a good size. There is nothing more humbling than learning new things and realizing you should always be on the road to growing and improving your craft. So here I am on the road to publishing more books in 2012. I am not one of those authors who churns out another book each year. I tried to be that kind of author in the beginning and my work suffered. I invest every ounce of myself into my work, which means I go through a period of depression after I finish each book. Nobody prepared me for the post-book depression when I published From the Darkness Risen and it took me by surprise. It felt like giving away a child. I went through the same depression after I published Unveiled: Fanny Chamberlain Reincarnated and I expect to go through it in 2012 when Revolution’s Promise and From the Darkness Risen Book II are released, and then in 2013 when She Loved the Assassin is released. I am hoping to release From the Darkness Risen Book II in April and Revolution’s Promise in time for Bastille Day (July). 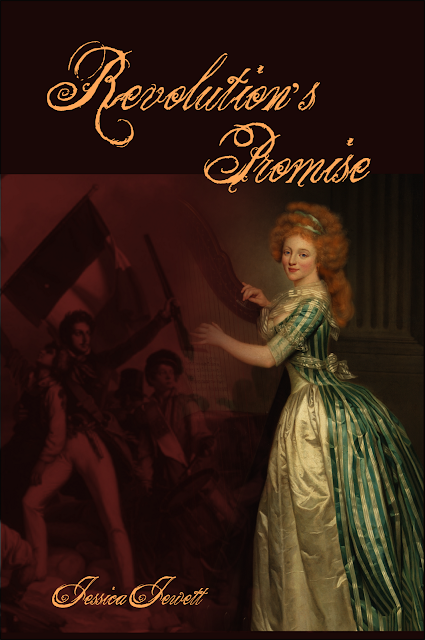 Today I did a mock up of the cover design for Revolution’s Promise. Here it is below. The edges might look wonky and unfinished but that’s only because the printers cut off the edges, so I don’t necessarily need to waste time making them look finished. I had a hard time coming up with a design for this cover because the story is so complicated. I wasn’t sure how to convey it visually. Revolution’s Promise is a story of the last decade of the French monarchy as told through the voice of Céline de la Barré. Her life is aristocratic, comfortable, and extremely sheltered, although she witnesses the secret intrigues of less than savory figures in her family. She is a painter under the tutelage of the Queen’s portraitist, Madame Élisabeth-Louise Vigée-Le Brun, and really has no direction in her life until she meets a master craftsman’s apprentice, Georges Alexandre. They fall in love despite their best efforts to avoid each other because she watches the pain her sister endures from being in love with a man their father refuses to accept and she doesn’t want to put herself through that suffering. As the revolution boils, Georges opens Céline’s eyes to the suffering of the common man, leaving her with the decision of allowing herself to face arrest and execution with her family, or attempt to escape France and begin a new life as a common woman. In a nutshell, that’s the story. There are several subplots that I didn’t even mention in that little summary. You see how difficult it was to come up with an adequate cover design. I arrived at that mock up by looking at the work of Céline’s contemporaries in the French artistic world. The clash of the soft beauty and the bloody revolution was important for me to convey as well. I chose two paintings to blend together. 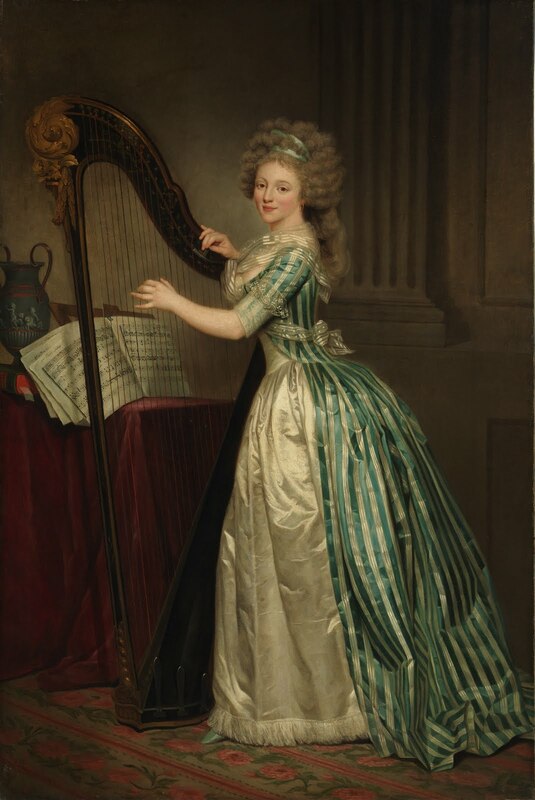 If you notice, the portrait of the lady playing the harp has a different hair color and eye color in the original version than what you see on my cover design. That painting is a self-portrait of Rose-Adélaïde Ducreux that she completed in 1790. My Céline is a redhead with blue eyes, so I tinted the hair color and eye color to match my character. It took forever to find a good candidate to be Céline and I swapped out about a dozen different portraits from several countries. 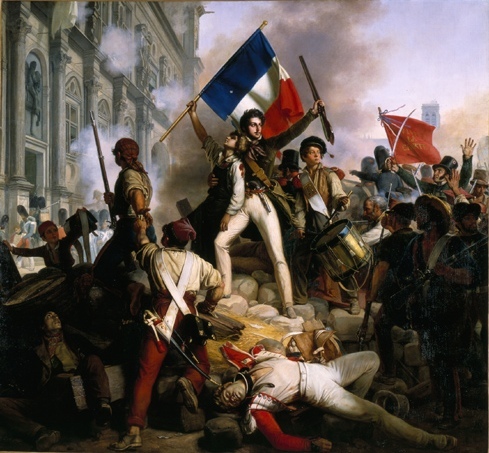 From there, I cropped out the section of the French Revolution painting that I needed and added a transparency effect. I left my version of Céline in color because she is the focus of the novel, and the struggles of the common man were symbolically left in the background because that’s how it was in her life for the most part. I added the necessary text and there you have it! A book cover! Between now and next year, the title may change. I’m very indecisive about book titles. From the Darkness Risen went through about eight titles in the six years that it took to complete it and the final title was actually chosen in the eleventh hour. Right now, I can’t think of anything better than Revolution’s Promise but as I go through the revolution with Céline, I may be guided to something that packs more of a punch. Since news broke that the Duke and Duchess of Cambridge have decided to move into Kensington Palace while they are in London (their primary home is still the cottage in Angelsey, Wales), I decided to look at the history of the palace. We all know it as the place where Princess Diana raised Prince William and Prince Harry as boys but the history extends about three hundred years before then. 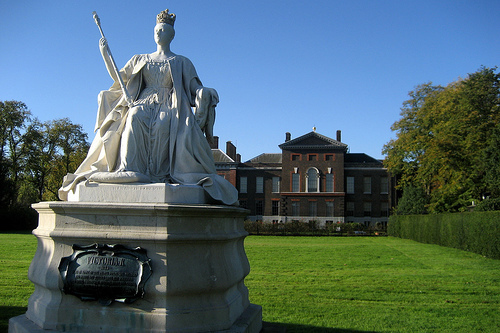 Kensington Palace has been used as a residence of the British royal family since the 17th century. It is divided into several different apartments. Currently, it is the official London residence of the Duke and Duchess of Gloucester, the Duke and Duchess of Kent, Prince and Princess Michael of Kent, and the Duke and Duchess of Cambridge. In the past, it has also been the official London residence of Diana, Princess of Wales, Princess Margaret and Princess Alice until their respective deaths. The original early 17th-century building was constructed in the village of Kensington as Nottingham House for the Earl of Nottingham. It was acquired from his heir, who was Secretary of State to William III, in 1689, because the King wanted a residence near London but away from the smoky air of the capital, because he was asthmatic. At that time Kensington was a suburban village location outside London, but more accessible than Hampton Court, a water journey on the Thames. A private road was laid out from the Palace to Hyde Park Corner, broad enough for several carriages to travel abreast, part of which survives today as Rotten Row. The Palace was improved and extended by Sir Christopher Wren with pavilions attached to each corner of the central block, for it now needed paired Royal Apartments approached by the Great Stairs, a council chamber, and the Chapel Royal. Then, when Wren re-oriented the house to face west, he built north and south wings to flank the approach, made into a proper cour d’honneur that was entered through an archway surmounted by a clock tower. Nevertheless, as a private domestic retreat, it was referred to as Kensington House, rather than ‘Palace’. The walled kitchen gardens at Kensington House supplied fruits and vegetables for the Court of St. James’s. For seventy years, Kensington Palace was the favoured residence of British monarchs, although the official seat of the Court was and remains at St. James’s which has not been the actual royal residence in London since the 17th century. Queen Mary died of smallpox in Kensington Palace in 1694. In 1702 William suffered a fall from a horse at Hampton Court and was brought to Kensington Palace, where he shortly died. After William III’s death, the palace became the residence of Queen Anne. Sir John Vanbrugh designed the Orangery for her in 1704, and a magnificent baroque parterre 30 acre (121,000 m2) garden was laid out by Henry Wise, whose nursery was nearby at Brompton (illustration, left). 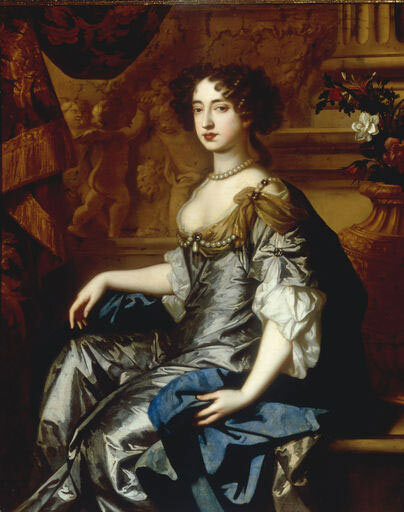 Anne also had Christopher Wren to complete the extensions that William and Mary had begun, resulting in the section known as the Queen’s Apartments, with the Wren staircase, known as ‘The Queen’s Entrance’, which currently serves as the exit point, with shallow steps so that Queen Anne could walk down gracefully. George I spent lavishly on new royal apartments from 1718. William Kent painted a staircase and some ceilings. In 1722 he designed the Cupola Room, the principal state room, with feigned coffering in its high coved ceiling; in 1819, the Cupola Room was the site of the christening of Princess Alexandrina Victoria, who had been born at Kensington, in the apartments of the Duke and Duchess of Kent (the actual room being what is now the North Drawing Room). The last reigning monarch to use Kensington Palace was George II. For his consort, Charles Bridgeman swept away the outmoded parterres and redesigned Kensington Gardens in a form that is still recognizable today: his remaining features are The Serpentine, the basin called the Round Pond, and the Broad Walk. After George II’s death in the palace in 1760, Kensington Palace was only used for more minor royalty, including the young daughter of the Duke of Kent who was living in the Palace with her widowed mother when she was told of her accession to the throne as Queen Victoria. Queen Mary (grandmother of the present Queen) was born at Kensington Palace in 1867. Her parents, the Duke and Duchess of Teck, were living at the palace. Edward VIII called the palace an “aunt heap” because of the number of royal relatives residing there. It is not so commonly known that Kensington Palace is very haunted by its past residents. In my research, I actually found a lot of tourists on message boards who described the palace as having a heavy atmosphere for no apparent reason. A few people went as far as to suggest that Princess Diana’s self-destructive problems were aggravated by living in a palace so haunted by unhappy, negative ancestors. Only Princess Diana could shed light on that suggestion but unfortunately she is no longer with us. The most commonly known identified ghost of Kensington Palace is King George II. 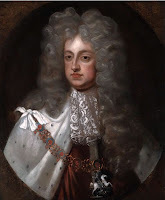 He was the last foreign born King of England and died in the palace in 1760 of a ruptured right ventricle from an aortic aneurysm, a cause of death most likely brought on by syphilis. At the time of his death, he was waiting for news from his native home of Hanover but messengers were delayed by bad weather. He died staring out of the window at a nearby weather vane asking, “Why don’t they come?” over and over again. It is said that his face has manifested many times looking to the weather vane. Some hear his voice in a German accent asking, “Why don’t they come?” In my opinion, this is most likely residual activity – an imprint of energy from a specific event replaying over and over again – because George II has never been reported to have interacted with the living or even seem aware that any living people are there. The great-granddaughter of George II, Princess Sophia, is also alleged to haunt Kensington Palace. This princess lived a very difficult life, never allowed to mix with people outside of the royal court. It has been debated that she engaged in an incestuous relationship with her brother, the Duke of Cumberland, but nothing was ever substantiated. 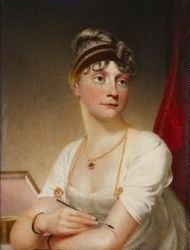 It is also said that Princess Sophia fell in love with a man named Thomas Garth, who was her father’s chief equerry. There are some reports that she gave birth to an illegitimate child in 1800, either fathered by the chief equerry or the Duke of Cumberland. Regardless of the validity of these reports, Princess Sophia never married and her life was rather lonely. She found solace in her spinning wheel, but as her old age made her go blind, she wasn’t even able to do that anymore. Today, people in Kensington Palace have reported hearing the sound of a spinning wheel throughout the palace where there is no spinning wheel. The princess may still be carrying out her lonely existence and comforting herself with her favorite hobby long after her death. Queen Mary II, wife of King William III, apparently haunts the Queens Apartments in Kensington Palace where she died in 1694. She was a very tall queen for her time, standing at 5’11, making her taller than most men in her life as well. She was responsible for many improvements to the palace until she contracted smallpox at the age of 32. Her kindness made her send away anyone in the palace who had never been exposed to the disease before as to prevent them from catching it. Her death in December 1694 devastated the King, who fell from a horse in 1702 and died in the same palace. Today, the Kings Apartments and Queens Apartments open to the public as the combined State Apartments. Mary II’s ghostly activities certainly preside over any renovations and improvements made to the palace in death since it was her husband who first purchased the palace. Some stories say Mary can be heard weeping for the children she never had and the short life she lived. The grounds of Kensington Palace are haunted as well. A man in white breeches has been seen walking around and then disappearing into thin air. Nobody knows who he is but most of the unknown ghost stories in royal palaces throughout the world are attributed to the thousands of unnamed servants who attended royal families in history. Does Queen Mary weep in the Room of Sorrow for the babies she never had? Does Peter the Wild Boy still run amok in the Room of the World? Who stands at the window waiting for the ships from home? As you are guided through the shadowy world of Enchanted Palace in the State Apartments, you will be regaled with chilling tales of mysterious sights and strange stories in our new Eerie Evening Tours of Enchanted Palace. Book yourself on these limited and exclusive tours in order to enjoy the unique atmosphere of historic Kensington Palace at night. The Eerie Evening Tours of Enchanted Palace will run over the Halloween weekend – Friday 28, Saturday 29, Sunday 30 and Monday 31 October 2011 only. There will be one tour per night 18.45h – 20.15h. The price will be £20.00 per person and tickets will go on sale soon. There will be a maximum of 25 places per tour. Please note that Enchanted Palace has limited accessibility – please see here for full details. Not recommended for under 12s. There will be only one tour per night with a maximum of 25 places per tour. Not recommended for under 12s. The price will be £20.00 per person. Do keep an eye on this page as tickets will go on sale soon.